Do sharp pains in your hip make it difficult to get up in the mornings, move about during the day, and lie back down at night? Do your knees feel unstable and painful, as if they may buckle underneath you without warning? Hip joint pain and knee pains can seriously interfere with your life, especially if you are dealing with both. 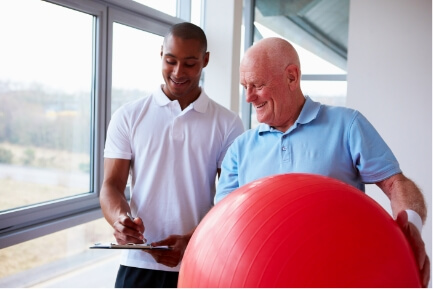 Whichever may be hurting you, physical therapy can help get to the root of your problem safely and comfortably, without the need for harmful drugs or surgery. Contact Partners in Physical Therapy today to schedule your appointment with one of our physical therapists! The physical therapy treatments at Partners in Physical Therapy can help to greatly reduce your hip and knee pain. In many cases, it can even relieve it altogether, sparing you the need for potentially harmful medication or surgical correction. Our physical therapist will examine your hip and/or knee for signs of misalignment or structural damage, in addition to examining your stance, posture, gait, and range of motion. After your physical exam is complete, our physical therapists will prescribe a physical therapy plan for you, aimed at relieving unnatural stresses and strains, and normalizing your joint function. It is time to take a stand against your hip and knee pain. Contact Partners in Physical Therapy today at Lake Charles, LA center to speak with one of our dedicated physical therapists, and get started on the path toward long-lasting pain relief. Relieve pain in knee with the help of physical therapy. Your hips and knees will be glad you did!